Certainly our confidence in what God says, especially his promises, must be founded upon 'His Holy Scriptures’ however this could be better stated by not focusing on just “God’s promises”, but instead, have the faith to believe that the entire Holy Bible is the inspired trustworthy word of an infinitely Holy and perfect God. To have a deep understanding of Scripture a person must first have been born again (brought to life spiritually) which means that you have received the indwelling of the Holy Spirit and have joined the Kingdom of God. The gift of the Holy Spirit is associated with the moment you receive Christ’s forgiveness of your sins and having become a member of the Kingdom of God. Only then, can you expect to be guided by the Holy Spirit into an understanding of God’s truth for your life. This brings us to the question of just what is the 'gospel of Jesus Christ’. Paul makes it very clear in Gal.1:9 that there is such a thing as a false gospel. A short but concise description of the gospel is given by Paul in 1 Cor. 15:1-5. Whatever we think the gospel might be we must not alter the intended meaning of these verses. Another important point that appears to have been overlooked in this week’s Quarterly daily lessons is that the epistles of First and Second Thessalonians were addressed to born again spiritually alive Christians who have already received the benefits of the gospel message. Paul is addressing fellow members of the Kingdom of God on how they are to grow spiritually. Because they are already Christians he doesn’t need to repeat to them what they already know and has become part of their lives. Spiritual life is very similar to our physical life in one significant way. First you are born and then you grow. You cannot have spiritual growth without first having a spiritual birth. It is rather silly to think that your spiritual birth occurs after a lifetime of 'reaching perfection’. 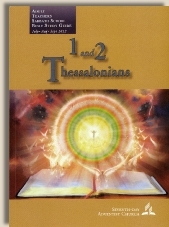 Even though this quarter is titled '1 and 2 Thessalonians’ the Quarterly lessons for this week pay very little attention to the contents of these two epistles. In fact, today’s memory text jumps to Chapter Two Verse Thirteen without reference to Paul’s introduction or even the slightest mention of Paul’s overall theme. The lesson does make a good point by mentioning that our understanding of “God’s promises” must be based upon Scriptures. However, it must be emphasized that if you are 'speaking in the name of God’ only the Holy Bible is to be considered a reliable source of God’s truth and it is the only foundation for our Christian faith. All else, including this commentary, must conform to Scripture and not the other way around. The central cause of all our problems 'in this present life’ is that when we are physically born we are born spiritually dead because of the death of Adam the instant he sinned, Genesis 2:16, John 3:1-20. Sin is the root cause of all that is evil in our lives. Because of what Jesus did on the cross he is able to offer us forgiveness of our sins. For those who receive this forgiveness Jesus provides the Holy Spirit who indwells us and brings life to our dead spirit which is equivalent of joining the Kingdom of God. Jesus’ gift of the Holy Spirit includes leading each and every Believer into God’s truth. The challenge for those who are serious students of God’s word is to study these epistles for yourself and see if you do not agree that they can be summarized with one word: sanctification. That is, Paul is exhorting and encouraging the Believers in Thessalonica in their spiritual growth and for them to continue to persevere under some very difficult persecutions. While the real gospel certainly is the foundation for their sanctification, this is not the focus of Paul’s message in these two epistles. Put another way, you don’t always need to be telling Christians how to become Christians since that is what they are. A primary purpose of repeating the gospel message to Christians is to confront heresy like Paul was doing when he wrote to the Galatian church.